It’s all you expect from a domestic workhorse seat in first class. Broken in leather and a cushy headrest. – United A320 in First Class. Seat(s): They’re pretty well maintained but these United First Class seats aboard an A320 have a comfortably broken-in look to them. Like an old baseball glove where day-worn business travelers play the part of baseball. You’ll likely be happy with the legroom if you’re used to something like Delta’s A320 in first but with United’s 3 different configurations of this plane, that advantage varies. 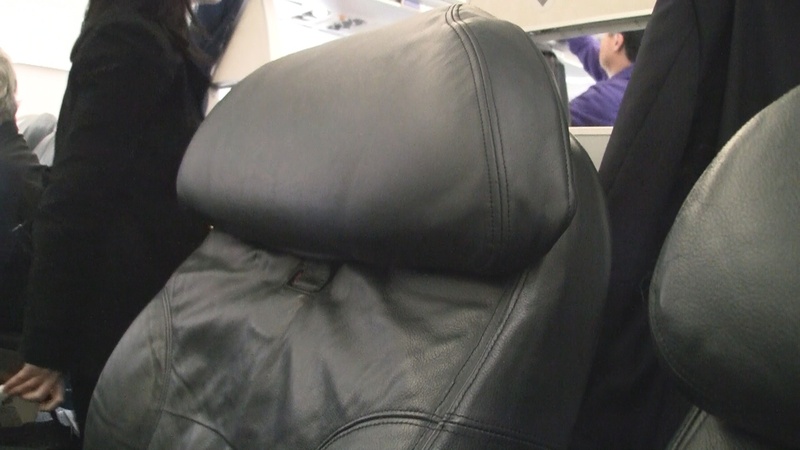 Elbows and heads benefit from wide consoles and cushy headrests, respectively and recline is good in all three rows including this, the last row of first. 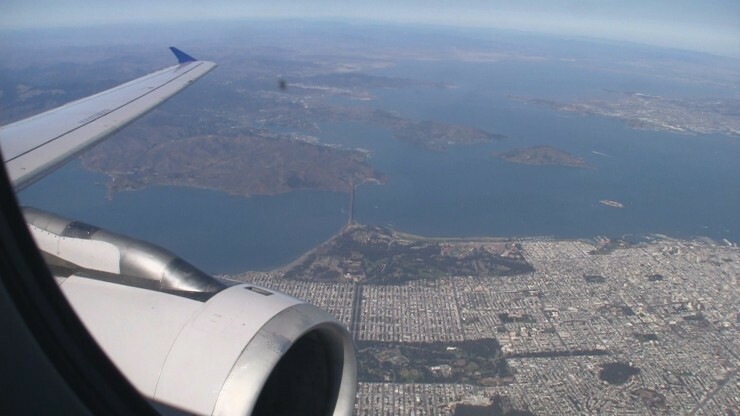 Tech/Connectivity/Entertainment: At the time of review, United was in the process of installing satellite-based wi-fi aboard all of it’s planes and very near completeion aboard this type of plane. You’ll need to have your devices charged up though as there are no power ports on board. Aside from the promise of mile-high internet, you’ve got audio entertainment that includes (at the pilots discretion) “From the Flight Deck”, featuring live conversation between the flight deck and the ground. Banana/Juice = BR, Almonds = UNCH. 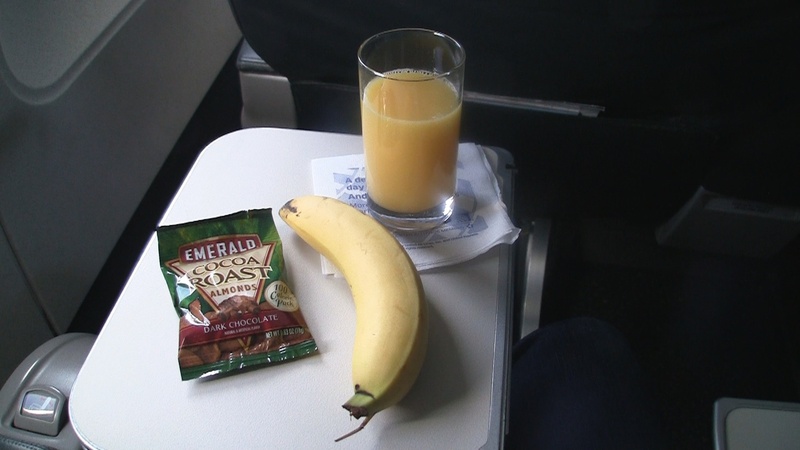 – Short-haul brunch in first aboard a United A320. Food: An overflowing basket of snacks that included everything from nuts to chips to bananas made it’s way back to row 3 twice and I didn’t hold back either time. If you’re looking for a full meal though, it’ll have to be a longer flight and/or at mealtime. United’s in-flight dining page breaks down in detail what flights get food. Service: With United I’m normally satisfied with flight attendants that start on the defensive and somehow manage to keep their forced smiles from turning into scowls. This time, I was happy to find myself floating somewhere closer to the “friendly skies”, as advertised. How we got em’: This was a space-available upgrade purchased via online check-in. A midday Saturday flight on business-friendly routes like this often yeild more opportunity for seats up front. Right now I’m not impressed with UA! Not only did we miss our connection flight, but they refused to get us on another flight with another airline. This was there mistake not ours.